The billboards were unveiled around the time Republican Ron DeSantis was sworn in as Florida’s governor. 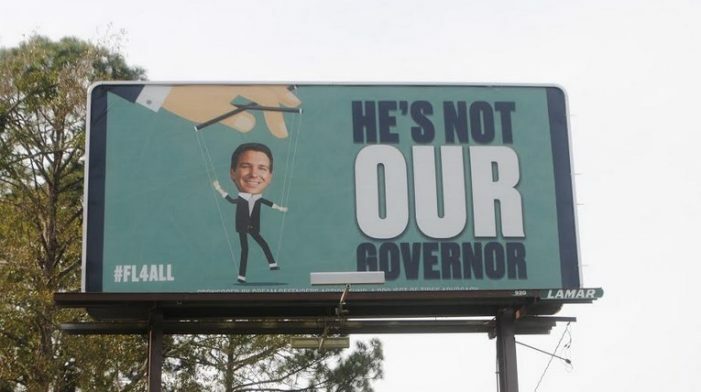 The billboards depict Governor DeSantis as a puppet attached to an orange hand. 17 Responses to "“Not Our Governor” Billboards in Tallahassee Financed by Anti-Police Group"
Yes. They blocked the intersection of Apalachee Parkway & Monroe in front of the Capitol during an evening protest. I witnessed TPD “help” them. I want to know how a bunch of poor leftwing radicals paid for a billboard campaign. Maybe a donation from their BFF Gillum? For the record: This group was also assisted by former State Rep. Alan Williams when it invaded the state capitol. Williams should have been disciplined, if not removed from office for his actions which may have been illegal. Additionally, the “Dream Defenders” have never had the courage to defend their “dream” in any kind of dialogue or discussion. There have been repeated efforts to get them to come on my radio program. 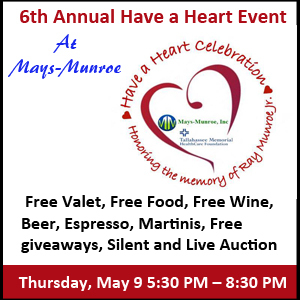 The invitations are no longer extended. As an FYI: available are photos of Alan Williams with Cynthia Barber (Barber is over Tallahassee Police) at a NFBPA convention in Virginia. Pictures were on the Tallahassee NFBPA [National Forum for Black Professional Administrators] city computers so just put in a Public Record Request.. This is the NFBPA convention with Kwame Kilpatrick was as an invited speaker. Take a minute to check up on Kwame and his current whereabouts now….Now google Kwame and NFBPA. Barber also brought additional City staff who worked in her section to that NFBPA convention. All paid for by the City of Tallahassee (including work hours). Your tax dollars at work. I wonder who paid for Alan Williams’ travel, conference fees, membership fees, per diem? Not the State? What’s the status of Tallahassee’s NFBPA today – is Cynthia Barber still President? Are the City NFBPA Staff still traveling nationally to NFBPA conventions via tax payers expense? How about inviting the Tallahassee Chapter NFBPA on your show? In addition to what Mr. Scott said, Monique Gillum, Andrew Gillum’s sister was part of the Dream Defender activists organizers. Amazing that Alan Williams was endorsed by the political elite when he ran for supervisor of elections to include members of our school board. So, it seems in the long run that Williams and Gillum made a miscalculation thinking that this organization would propel them politically… when in actuality it had the opposite affect. He should be their governor, they need to pull up their britches and realize the world is not theirs alone. Suggestion for a billboard featuring gillum: “He’s Not Governor, Period.” gillum’s eager association with such radical leftist-anarchist groups (widely reported by Sunshine State News, Breitbart.com, et al) is one of the main reasons he LOST the election. “Gillum and the Dream Defenders have had a long, close relationship which, frankly, has been largely unexplored in the mainstream media. The Defenders’ agenda is so markedly anti-police and socialist in nature that last week the Broward Sheriff’s Office Deputies Association, the union for Broward deputies — traditionally as blue as their uniforms — came out in support of Republican DeSantis. Most Americans LIKE and SUPPORT Law Enforcement. Police-Haters like The Dream-Offenders, BLM, Antifa, Code Pink and other radical Leftist groups are the political kiss of death to the candidates they publicly support. Keep it up, brainiacs. Put that on the same video billboard, so that it shows up right after the puppet one. And then when he’s indicted, add verticals bars to it, over the image of Gillum! That would be great, News Maven. I did think of having Gillum behind bars or in prison orange, but adding the change later (if that comes to pass) as you suggest would be much better! I would hope that Lamar Advertising would be boycotted over their terrible decision to publish this ad. You ARE his constituancy and DeSantis will care for you flakes better than crooked Andrew ever would or could. Just a reminder of the globalist agenda and one example who they’re using/funding/promoting to gain control. Another of their rising “stars”; Alexandria Occasional Cortex. To add a bit to the “globalist” aspect of all of this dreck that’s raining down on us/western societies: It is inevitable. There will be open borders, the United States will dissolve, the globalists will win, what we are seeing is the beginning of it. Do a search using “cashless society” and how convenient it is. A credit card with a chip is so convenient. Some retailers “Don’t accept cash at this register”. Try depositing $20 into a friend’s account as a favor for him and you’ll find that you might need to give them a government-issued photo ID for them to scan first. Most banks do this now as part of federal law (to prevent money laundering they say). That credit card chip would have been the size of a USB thumb drive just a few years ago and will get even smaller, some say the size of a micro dot and still contain all of your vital information as it does now. Who you are, birthday, your bank routing numbers, home address, credit history, etc..
And some say that chip, for convenience when shopping could actually be painlessly implanted into your hand or scalp to be scanned as soon as you walk near a register: REALLY convenient. If you believe what some fellows began writing in a book some 1,986 years ago, there will be a one world borderless global government which seems to be coming our way as we speak. People will have a “chip” conveniently implanted to be able to buy things. In fact, that chip will be mandatory. What is going on now is just the nascent and growing pains.